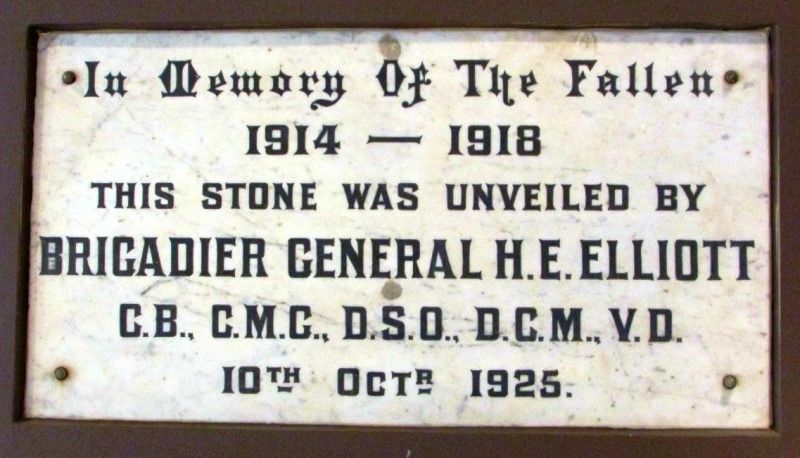 The Memorial Hall Foundation Stone commemorates those who died in service or were killed in action in World War One. The original foundation stone of the Returned Services League Memorial Hall was unveiled by Brigadier General H.E. Elliot CB, CMG, DSO, DCM, VD on the10th October 1925 in memory of the fallen of World War One. The present hall, marked by a tablet with names of RSL Hall Committee, Officers, Trustees and Patriotic Building Fund Trustees was opened and dedicated 10 June 1963. Memorial Hall to Start at Once. The Borough of Carrum branch, R.S.S.I.L.A. met at the Council Chambers, Chelsea, on Tuesday of last week. Mr. S. Greig Smith, vice president, was in the chair, and there was a large attendance of members. A recommendation from the Building Committee, regarding the memorial hall, was adopted, viz. : That the tender be let to Mr. R. J. Scott, of Hawthorn (who is a returned soldier), his tender being £1389. The building will commence almost at once. We understand that this was not the lowest tender. Frankston and Somerville Standard (Vic), 22 May 1925. In the presence of a large number of returned soldiers and citizens of the district, Senator Elliott on Saturday afternoon declared open the Carrum Borough`s Soldiers Memorial Hall which has been erected in Chelsea. In a brief address, Senator Elliott spoke of the loyalty and devotion of her people which led Australia to send an army to the battle-front to fight side-by-side with the soldiers of Great Britain, the country which had protected Australia for so many years. The defeat of Germany and her allies, he said, symbolised the moral and spiritual gain of British ideals over those of the Germans. The Argus (Melbourne), 7 December 1925. C.B., C.M.G., D.S.O., D.C.M., V.D.